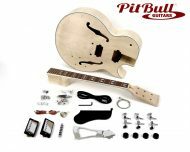 Our GR-1SF electric guitar kit includes a full size, hollow (not semi hollow) Basswood body with triple binding. Maple set neck with Rosewood* Fretboard. Stock chrome hardware includes two humbucker pickups and triple ply black pick guard. 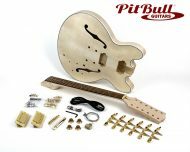 The bridge is a tune-o-matic style with a “Bigsby”(TM) style Trapeze tailpiece.